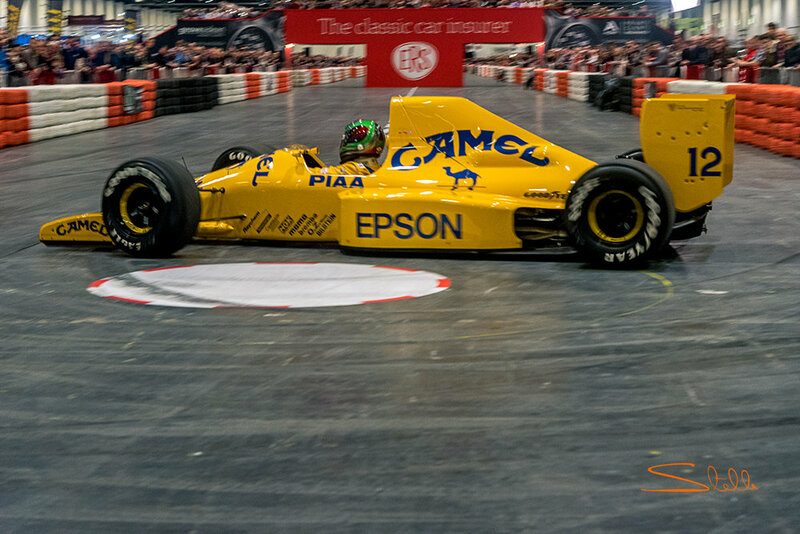 On Thursday 15 February, I packed up my camera and headed over to London’s ExCel’s Exhibition Centre for the fourth annual London Classic Car Show. For those of you who have not been, the show celebrates beautiful, classic motoring nostalgia in a dramatic setting and it is one of the highlights of my year! This year’s show was opened in a dramatic fashion by three well-known TV motoring presenters; Alex Riley (BBC One Show), Jonny Smith (Fifth Gear and Mud, Sweat & Gears) and Quentin Willson (BBC Top Gear, Fifth Gear and The Classic Car Show). It was clear right from the opening that the show was going to be bigger and better than ever before. 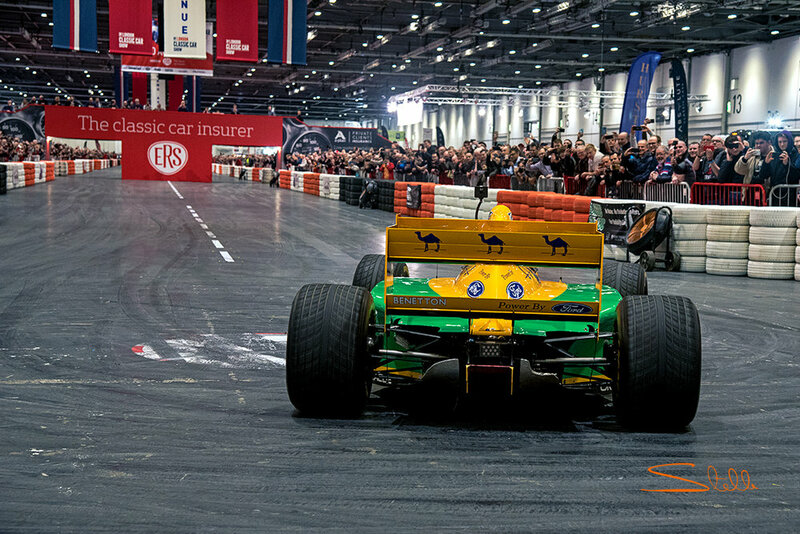 Once again, an enormous indoor race track, known as the ‘Grand Avenue’, ran through the centre of the ExCel, enthralling visitors and allowing them to see – and hear – some of their favourite classics in action. The car above is a 1907 Stanley H4 Gentleman's Speedy Roadster, the hypercar of its era. The show paid homage to ‘Getaway Cars’. This was an evocative tribute to those vehicles made famous in movies or used in headline grabbing real-life robberies and was curated by Philip Glenister, aka DCI Gene Hunt from BBC police dramas Life on Mars and Ashes to Ashes. 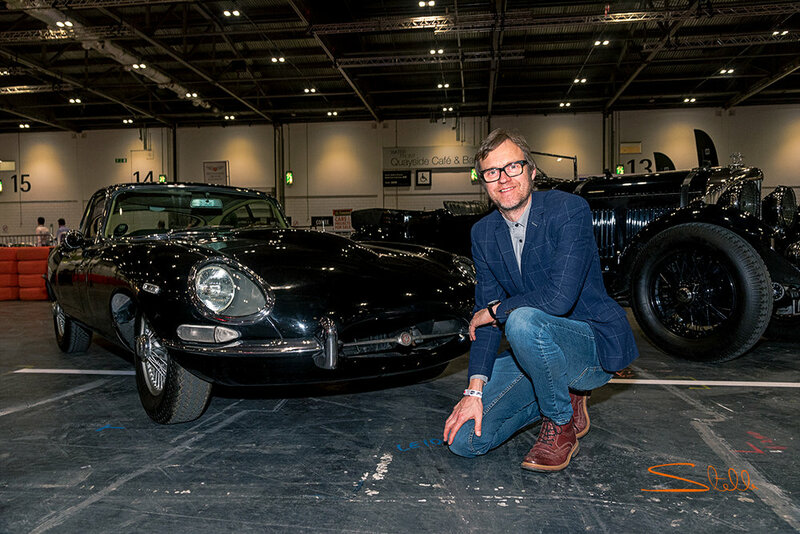 Alongside the vehicles made famous for dramatic escapes, the show welcomed their very own celebrity drivers with actor Nick Moran of Lock, Stock and Two Smoking Barrels reliving various of his film roles at the special display. Nick Reynolds, the son of Bruce Reynolds, was reunited with the very Lotus Cortina that his late father used to stake out the Great Train Robbery in 1963. The Lotus has just 3,500 miles on the clock and is still fitted with the same tyres that helped the police to hunt down the gang! Nick Moran with the Italian Job Mini Cooper brought to London. Nick Reynolds with his father Bruce Reynolds' Lotus Cortina used in The Great Train Robbery. 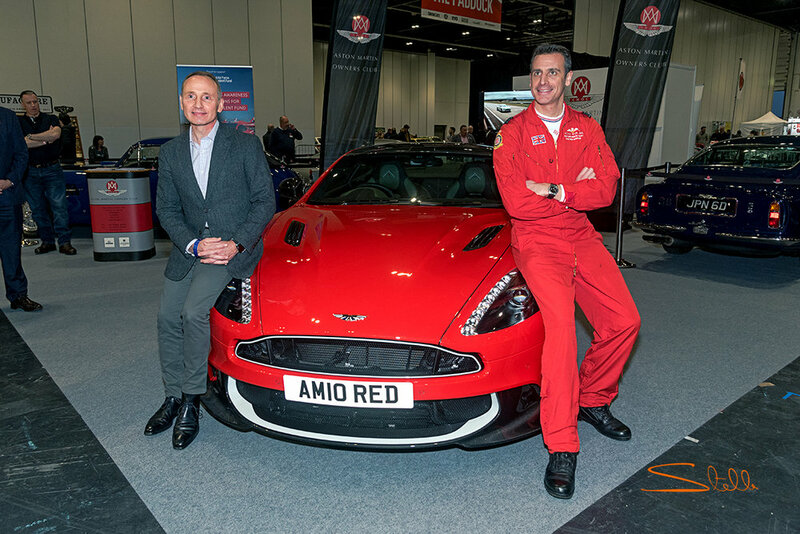 Squadron Leader Adam Collins from the RAF Red Arrows was on the Aston Martin Owners Club stand with a Vanquish S Red Arrows limited edition model, which was recently raffled for a huge £1.5m, earning for the RAF Benevolent Fund. He was joined by Humphrey Bradley from south east London – the lucky man who won the car. The opening evening witnessed a pair of major global car launches with two of Britain's most iconic marques unveiling spotlight-stealing new models. First Morgan took the wraps on its latest +4 Club Sport and then Lister revealed its never-seen-before Thunder. This year’s theme was ‘Specials’, which put the spotlight on an eye-catching gathering of road and race cars steeped in history and mystique. No fewer than 60 hand-picked classics were fired up for jaw-dropping, not to mention very noisy, displays on The Grand Avenue. As the dramatic live show came towards its conclusion, the show opening trio of Riley, Smith and Willson selected four stand-out cars with a combined value of more than £3m to join the parade: a 1931 Bentley 8-litre; a highly-original 1961 Jaguar E-type; a 1992 Jaguar XJ220 and a 2015 McLaren P1 hypercar – a classic car of the future. The trio was joined by former Blue Peter and GMTV presenter Anthea Turner for the photograph next to the Lister Thunder. The Morgan latest +4 Club Sport takes its place on the Grand Avenue. Presenter Alex Riley with the 1961 Jaguar E-Type and 1931 Bentley 8 litre. A 1934 Rolls-Royce 20/25 Gurney Nutting - a shimmering silver masterpiece of the coachbuilders' art. A 1989 Lotus Judd Type 101, Chassis no 3 - an aerodynamically ambitious Camel. On Sunday, the racing legend Nigel Mansell CBE arrived at the show to talk about a special collection of his racing cars and to provide a fitting close to the event. The 1992 F1 World Champion wowed Sunday crowds with some wonderful driving displays on the Grand Avenue, which included a wheel-spinning entrance behind the wheel of a Jaguar E-type inspired Eagle Speedster. He later returned in a red Ferrari 246 Dino F1 front-engined F1 car from the late fifties and was also reunited with some of the cars which he raced during his roller-coaster career. At the end of his performance on the Grand Avenue, Nigel was awarded the 2018 London Classic Car Show Icon award. All in all, this year’s show was a brilliant experience from start to finish. Nigel Mansell CBE was a real highlight for me, especially his performances on the Grand Avenue, his interview at the Supaguard Theatre and his presentation of the London Classic Car Show Icon award. I hear the show attracted over 38,000 visitors and featured close to 700 of the world’s finest classic cars worth more than £300m. Next year’s dates for your diary are 14-17 February 2019 - I am looking forward to it already! To see a variety of other photographs from the event please click this link to our sister website 'Stella'. Please follow me on Instagram for new pictures and stories of future events on @stellasms and @stellascordellis.